Powder diffraction is one of the primary techniques used to characterize materials, providing structural information even when the crystallite size is too small for single crystal x-ray diffraction methods. There has been a significant increase in the application of powder diffraction in recent years, both in research and manufacturing, fuelled by improved instrumentation, data processing and awareness of the information that can be obtained. Powder diffraction allows for rapid, non-destructive analysis of multi-component mixtures without the need for extensive sample preparation. This gives laboratories the ability to quickly analyse unknown materials and perform materials characterization in such fields as chemistry, materials science, geology, mineralogy, forensics, archaeology, and the biological and pharmaceutical sciences. 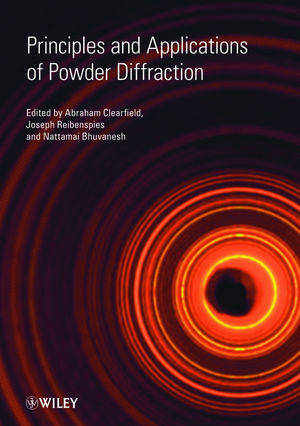 This book provides a concise introduction to modern powder diffraction methods with particular emphasis on practical aspects. It covers the background theory of diffraction in a form approachable by those with an undergraduate degree. Whilst individual chapters are written as stand alone sections, the text is sufficiently focused so that it can be read in its entirety by the non-specialist who wants to gain a rapid overview of what they can do with modern powder diffraction methods. Abraham Clearfield is Distinguished Professor of Chemistry, Joseph Reibenspies and Nattamai Bhuvanesh are Senior Research Instrument Specialist and Research Instrument Specialist, respectively at the Department of Chemistry, Texas A & M University, USA. Chapter 1. An Overview of Powder Diffraction. Chapter 2. Introduction to Diffraction. Chapter 6. Phase Identification/Quantitative Methods. Application focussed approach showing the user how PXRD can be applied to the analysis of a wide range of samples, providing rapid, high quality information.